Located in the heart of Port Hope Ontario, the Ganaraska river is considered the best steelhead and Salmon fishery in Ontario. Flowing from the Sylvan Glen Conservation Area in Canton Ontario, it makes its way south through the Town of Port Hope, emptying out into Lake Ontario. Through the efforts brought forth by the Ganaraska River Conservation Authority and the Ontario Ministry of Natural Resources, the fishery has flourished due to to protected areas and The Fish Ladder Located at the south end of Port Hope Conservation Area. 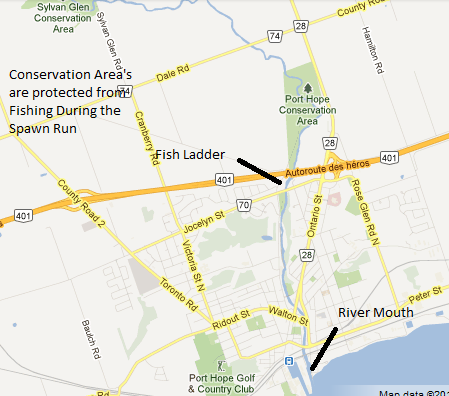 The ladder was built to allow pre spawned fish to access river pools north of the 401 Highway. In the Spring, Steelhead begin their journey up the Ganaraska to their spawning grounds. The water south of the ladder have an abundance of river pools that hold steelhead. Due to the shallow waters, catching these fish are difficult after sun up, but early morning may give you a few fights that will definitely be remembered. The drop in water temperature in late august and september brings schools of chinook salmon into the river and provides anglers with some excellent fall fishing. The salmon come into the river to spawn and aggressively hit baits such as: roe fished on bottom or under floats, cleos and other small spoons. This time of year, concentrating your efforts towards the lower end of the river and mouth will bring you the most success. During the fall run, the port hope area is over run with people from all over. I have personally spoken with fisherman from as far away as Nova Scotia, and Northern Ontario such as Thunder Bay. As the people that come to the area at this time are from different area's and many different ethnic backgrounds, some enjoy taking a fish or two for the table. Me personally, I like to encourage catch and release, in a timely manner. Releasing the fish will allow them the chance to finish their journey to spawn and hatch fish for our future generations to enjoy. Below are a couple of links to Video's taken of the Fish Ladder. 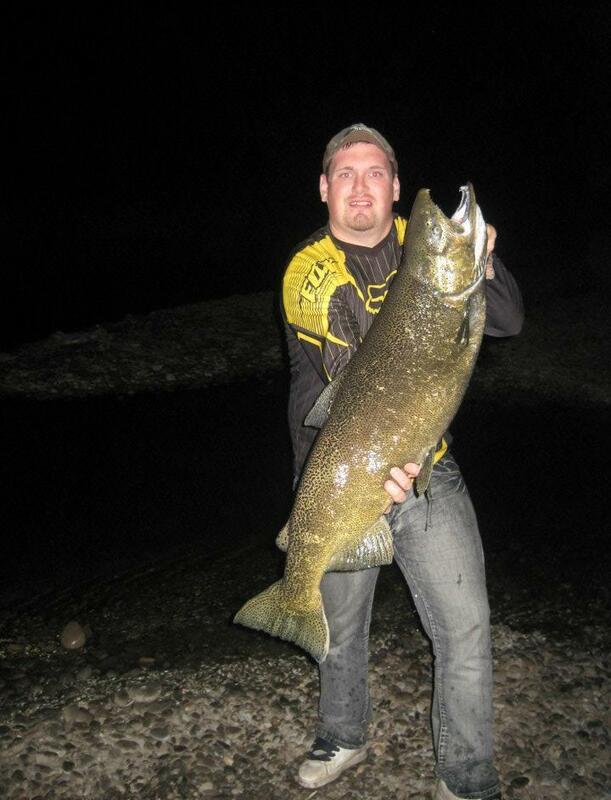 If you ever get a chance to make it to The Ganny for some Salmon or Steelhead fishing, do it. You won't be disappointed.